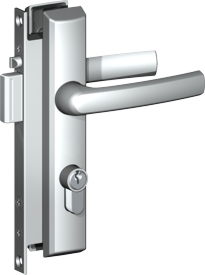 All our hinged doors come fitted with an Austral Elegance XC door handle with keylock. This enables the door to be locked from inside or outside with a key. Includes an interior snib lever (shown below) for quick and convenient locking from the inside without the need for a key. All our sliding Diamond Grille, Decorative and Contemporary and INVISI-GARD doors come fitted with an Austral SD7 sliding door lock. This enables the door to be locked from inside or outside with a key. Includes an interior snib lever (shown below) for quick and convenient locking from the inside without the need for a key. Self-latching lock bolt engages automatically when the door is closed. As an optional upgrade for sliding doors the Austral SD8 lock can be fitted. It provides all the same features of the SD7 lock with a more contemporary and slimline appearance. In addition the fixing screws are only accessible from the inside, giving increased security. All our sliding Flyscreen doors come fitted with a pull handle (shown below) fitted to both the inside and outside of the door. As an optional upgrade any sliding Flyscreen door can be fitted with a snib (shown below). This handle enables the door to be snibbed from the inside. Note: no snib function from the outside. As an optional upgrade a triple lock mechanism can be fitted to our hinged or sliding doors. This offers added security protection by locking 3 positions into the door frame when you use the key or snib lock. Note that if there is ‘movement’ in your house (as is quite common) these triple locks can go out of alignment and become unreliable. In most cases we can match the keys of the door we fit to the existing one/s in your house. We can advise the easiest and most cost effective way to achieve this result. All our hinged doors come fitted with a standard Austral pneumatic door closer. This allows the door to close automatically but not slam. All closures have an adjustment screw which allows you to adjust the force with which the door pulls closed with a screwdriver. All our stainless steel hinged doors come fitted with a heavy duty Austral pneumatic door closer. Sliding doors DO NOT come with a door closer as STANDARD however as an optional upgrade there are 2 options for automatic closers. A self closing mechanism for sliding doors. Great for those who were “born in a tent” and forget to close the door behind themselves. a weight inside a tube which is attached to the door frame. The weight is lifted by a fishing line attached to the main door when the sliding door is opened. The weight then pushes the door shut when released. The water inside the tube cushions the impact and slows the speed of the movement, reducing risk to fingers. All our hinged doors come fitted with 2 regular hinges and our INVISI-GARD doors come fitted with 3 regular hinges. Regular hinges are powder coated to match the frame of the door (15 colours) or provided in black. As an optional upgrade stainless steel hinges are available in black or steel. This should be considered in salty areas 5-10km from the beach. Our basic pet door suitable for ‘well mannered’ pets. Our heavy duty pet doors also available in 2 sizes. We have a range of tracks that can be fitted as required to ensure smooth operation of our sliding doors.